If you were asked to name the ultimate American food or fast food on the game show “Family Feud”, there’s no doubt that hamburgers will probably be the top survey answer. Perhaps to the food amateur, he/she will be looking for the ground “ham” component from the burger patty even though the former is a slab of salt/sugar-cured pork while the latter comes from minced beef chuck. Hamburger was actually a German word coined after the city of Hamburg which served as an important Russian trade center of steak tartare (but that’s another recipe) during the last century of the Holy Roman Empire. Aside from simplicity, students like myself take into account the cost of a homemade burger versus a burger ordered from a fast food chain or restaurant. 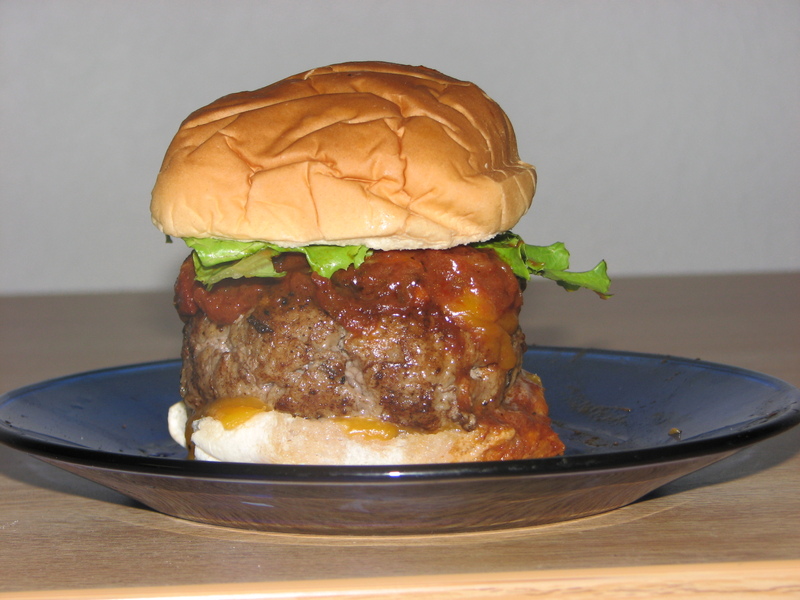 Assuming you don’t have to pay any state tax, service charge or value-added tax from your restaurant bill, the cost will still be at least thrice the price of making your own hamburger sandwich from the convenience of your own home. But, here comes a big (and all-caps) BUT!!! Advantages of simplicity and cost obviously compromise the ideal flavor, texture and taste. The patties greatly contract even before frying as mentioned above. They dry up by losing their juices upon frying. No matter how iconic the hamburger is to U.S. culture, Americans (no offense) have probably underestimated its simplicity. So where does the problem lie? Lipid/fat biochemistry. 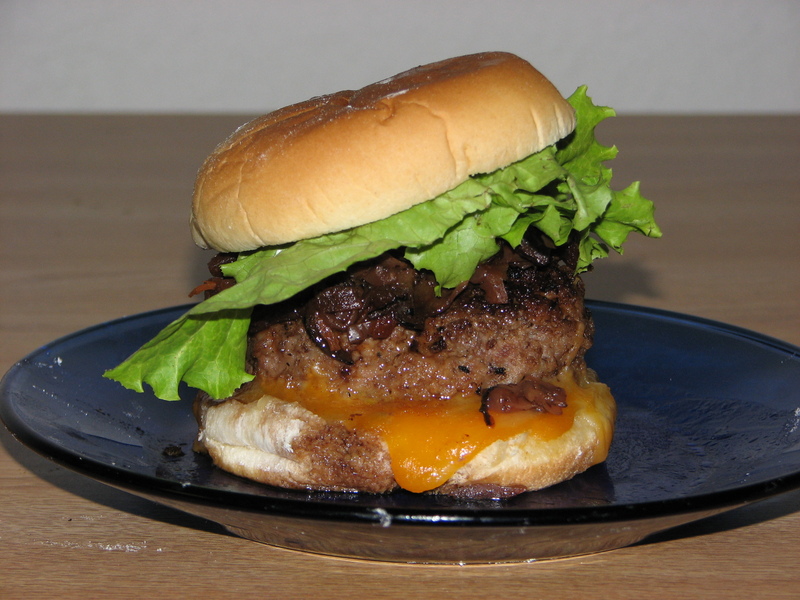 Fat inside the ground beef works two ways. Being hydrophobic or water-fearing, the presence of fat retains the moisture and juices inside the meat, therefore slowing down the dehydration/contraction process. It also adds flavor to the meat during heat-induced hydrolysis and/or oxidative cleavage. However, if fat degradation takes place at a faster rate before or during cooking, then dehydration will occur quickly too because water is less trapped due to reduced fat levels. To solve this problem, fat content of the meat is increased by adding sour cream, thus, keeping your meat swollen and moist during cooking. This is the scientific basis behind Julia Child’s hamburger recipe from The Way To Cook. I have a confession to make. I was pretty unsure of what might happen while I was preparing the entire hamburger meat based on Julia Child’s recipe. It turns out the result was awesome. The patty itself was so thick and fat as seen on both pictures. If you ask me about the taste, it was juicy and mouth-watering that I have to fry another patty to satiate my appetite. Honestly (and I don’t mean to brag), the burger was a lot better than the burger joints here in the U.S. or those from the Philippines. Also, if you are cutting costs, hamburger is probably the practical way to go. I finished the entire hamburger meat for 6-7 dinner meals at an estimated total cost of 10 USD. That’s spending around 1.50 USD for one night of fine dining without sipping a glass of red wine. 1. In a large bowl, season the ground beef with egg, grated onion, sour cream, thyme, salt and pepper. Mix thoroughly. 2. Divide them in any way you want to and shape them into round patties. 3. Film the frying pan with cooking oil under moderately high heat. 4. As the pan undergoes heating, lightly dredge each side of patty with flour. Fry each patty two minutes in one side and two minutes on the other. 5. If hamburger is squashy, then it is rare. Once the meat starts to bounce when pressing with a turner or your finger, it is medium rare. The hamburger patty is well done when it doesn’t bounce/spring back. Hi Kookie! I really like this recipe. Question lang: how do you store the burgers after you’ve prepped but not cooked them? Here’s my advice regarding storage. Then wrap each one loosely in clingwrap or aluminum foil. You can then freeze these. That way, you only thaw the ones you need when you want to eat them. Here is also another thing regarding storage of ground meat. I got this when I visited our neighbor/family friend several years ago to watch her make Shanghai-style dumplings. The longer the meat is stored in the refrigerator, the juicier it is when cooked. I think it would be ok to pop them into heavy duty resealable freezer bags or an airtight container. Max, got any other suggestions?